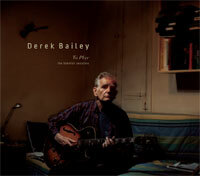 Night After Night: I don't know this world without Derek Bailey. I don't know this world without Derek Bailey. Warning: What follows these first few paragraphs is quite possibly the most self-indulgent concert review I have ever written, and you are more than welcome to skip it. The reason it's here is because today, I received a copy of a newly released Derek Bailey CD, To Play: The Blemish Sessions, just out on David Sylvian's Samadhi Sound label. The quick back story is that Sylvian -- formerly of new-wave group Japan, and more recently the creator of a long string of sublime solo albums, including collaborations with Robert Fripp and Holger Czukay -- brought Bailey into London's Moat Studios on Feburary 18, 2003 for a session slated to provide raw material for Blemish, a stark, introspective album Sylvian released the following year. A solo effort for the most part, Blemish also featured a handful of wildly ambitious collaborative efforts: "A Fire in the Forest," orchestrated by laptop soundscaper Christian Fennesz, and three songs in which Sylvian took portions of Bailey's free improvisations and scripted actual songs that adhered to their contours. The result is one of Sylvian's most deeply impressive creations. Some time after Bailey's death on Christmas Day last year (obituary here), Sylvian arranged to release much of the guitarist's raw session on disc, including one of the performances later used on Blemish. I've only spun To Play a few times now, so my thoughts about the disc are still forming. I don't get the immediate sense that it's among the guitarist's foremost solo efforts, but then, there's no reason to expect that it should be, given that Bailey knew he was effectively supplying sounds for hire. Still, it's good to have one more late example of his playing prior to motor neurone disease robbing him of his ability to hold a pick (a condition to which he responded with his final recording, Carpal Tunnel). And there are definitely some outstanding moments. Although I believe that at the time Bailey had yet to move to Barcelona, where he spent his final years, his frenetic strumming in "Play 4" conjures flamenco guitarist and dancer at once. The disc follows six tracks played on acoustic guitar with two final performances on electric, and it's in that last pair of cuts that the disc really comes to life for me -- Bailey was always a three-limbed guitarist. Throughout, To Play is an intimate affair that Bailey's admirers will certainly appreciate, not least for sound quality surpassing just about anything else that's emerged from the guitarist's final years. All of that said, please don't hold Derek Bailey responsible for what follows. My penultimate live encounter with Bailey was in the Company weekend he presented at Tonic in New York City in April 2001. On April 12, Bailey played solo, then performed with Loren Mazzacane Connors and Thurston Moore. The room was packed and I didn't stay for the trio, heading off instead to catch Lamb of God and the Haunted at CBGB. But just over a week later, Bailey mounted a Company weekend, which he discussed in a fine episodic interview compiled on the AllAboutJazz website last year. Bailey's colleagues included a handful of European players with whom he'd been working recently -- tap dancer Will Gaines, bassist Simon Fell, then-cellist Mark Wastell and harpist Rhodri Davies (surely the only musician on the planet who has collaborated with both Bailey and Charlotte Church) -- and a clutch of downtown New Yorkers -- saxophonist John Zorn, drummer Joey Baron, pipa player Min Xiao-Fen, keyboardist Annie Gosfield and violinist Jennifer Choi. I didn't save a copy of that review, and that has bugged me from time to time over the years. Chalk it up to the sentimental mood brought on by listening to To Play a few times today...through a bit of diligent Googling, I finally tracked down that review tonight. I'm posting it here for my own sake more than anything else -- and, as I said at the beginning, you're welcome to ignore it. I've added links to photos taken the following night by Peter Gannushkin, proprietor of Downtownmusic.net. Peter apparently didn't shoot Gaines, one of Bailey's most unusual and inimitable improvising companions, but this page on Peter Stubley's European Free Improvisation site offers brief video excerpts from Will, a VHS tape Bailey issued on his Incus label in 1995. A sizable crowd has convened for the first night of three Company evenings at Tonic in New York City. Most of the chairs are either on stage or have been pulled out to make more room. Most of the chairs that remain are taken by friends and family of the ensemble and by Tonic regulars who bypass the line at the door. It's going to be a long night of standing. I feel like a curmudgeon before it even starts. But at least, unlike last week's solo set by Bailey, tonight I can actually see the stage. A portly gentleman, looking rumpled like Edward R. Murrow, with a beard sans mustache, gets up to speak. Before he says anything, I can tell he's British. No one wears a beard without a mustache except hippies and Brits, and the portly, rumpled gentleman is too old to be a hippy. When he opens his mouth, I'm proven correct in my assumption. His name is Roger Parry, and he's here to be master of ceremonies. He carries a small bag over his shoulder, the airline tags still attached. The first ensemble, Roger Parry tells us, is "Simon's Group," and he introduces the players. Simon Fell [photo] takes the stage, accompanied by Min Xiao-Fen [photo], Annie Gosfield [photo] and Joey Baron [photo]. Min and Fell begin to flutter across the necks of pipa and bass respectively. They play a lot of notes. Their techniques are awesome. Min, however, seems somewhat mannered. What she is playing doesn't really connect with Fell's broad strokes and skittering lines. Baron accompanies with slow rubs across his drumheads; Fell responds with glissandoes while Min continues to scrabble up and down her fretboard, scraping her frets like a guiro. Gosfield stares at her equipment. She stares at the soundperson. She stares at the equipment, then the soundperson. No sound comes forth. By the time Fell, Min and Baron finally lock together, Gosfield is producing the sound of bowed metal. Then the piece ends. Roger Parry stands up and introduces the players again as they leave. Next, Roger Parry introduces "Zorn's Group." Zorn [photo] comes up with Derek Bailey [photo], Mark Wastell [photo] and Jennifer Choi [photo]. Zorn has a few muted words with Roger as he takes his stool, then announces to no one in particular, "John Zorn with strings." He clicks, pops, burbles and squeals. Bailey joins in, playing Derek Bailey music. Wastell proves quickly that he may possibly be one of the most technically proficient and daring cellists on the planet. (Jon and Brian have told you that already.) Choi enters with a gigantic chord that sounds like the opening of a Bach unaccompanied partita. Her fingers fly up and down the neck of her violin. Her bowing technique is immaculate. No one is speaks the same language for a time, but it's an agreeable racket anyway. Roger Parry gets up and announces who we have just heard. Then he ushers onto the stage the entirety of the ensemble: "Will's group." He announces the players as they come to the stage, one by one. Will Gaines is the last to come onstage. He surveys the crowd. "I left more people home in bed," he tells us. Bailey kicks off the performance by simply starting to play. The others enter, and Gaines begins to dance his impressions of the music. Zorn can barely contain himself. He mugs and laughs. Baron, too, is visibly beside himself. They are riveted with amusement as Gaines tries to conduct the ensemble, not unlike Butch Morris, except Butch Morris seldom tap dances. Gaines jumps, points, shouts, gestures, tries to shape the chaos unfolding onstage. He largely suceeds, with a few exceptions. Bailey doesn't see him, because Bailey never looks up. Zorn has decided quickly that he is going to mess around with Gaines. Gaines holds his hands high above his head, then brings them down to silence the ensemble. Almost everything is quiet, except Bailey keeps on playing. Zorn blows a bark at Gaines. "I liked that last note," Gaines says. Gaines indicates that he wants Rhodri Davies, Min and Bailey to play together. Bailey obliges, never looking up. The sounds of the guitar, harp and pipa sound an agreeable accord. It's the first time anyone can hear the harp. After a moment, Baron bursts in with an eruption of flying limbs. Bailey lets a note hang in the air, transforming itself into ringing feedback. Zorn matches the feedback with his sax. Gaines looks on in appreciation, then jumps and waves as the entire ensemble comes crashing back in. It is a huge wall of noise with funny contours and edges, and it is beautiful. Annie Gosfield is apparently playing something. Her hands are moving. So is her hair, which is large. Gaines waves the ensemble out. Bailey obliges, not looking up. Gaines performs an animated duet with Min, who is clearly enjoying it. Zorn and Baron misbehave from the opposite end of the stage, shooting spitwads of sound in their direction. Gaines waves reproachfully, but the bad boys will not be scolded. Gaines finally remembers the old maxim: if you can't beat them, join them. He engages Baron in a drum battle. Of course, Gaines, like the fat, bald American wrestler Butterbean, isn't here to win any battles. He's only here to entertain the fans. Baron wins in the first round. Gaines tries to play with Zorn as well. Zorn pulls his mouthpiece off of his horn, and blows raspberries back at Gaines. Is this how we show respect for our elders? Bailey, without looking up, has heard enough. Like a stern schoolmaster, he scolds the two with a resounding chord. Zorn blows raspberries back at Bailey. Everyone starts to play again, trying to look in the other direction. But Bailey's guitar begins to feed back again. The ringing gets louder and louder, and the other instruments fight to be heard. (Davies and Gosfield appear to be fighting to be heard.) Gaines gestures for the noise to build and build, until finally jumping up in the air to bring it all to a halt. Zorn plays a rude note, and Gaines shoots him a smile. Zorn plays another rude note, and Gaines shoots him another smile. Zorn plays another rude note, and Gaines shoots him a smile. Roger Parry stands up and introduces everyone. Everyone leaves the stage, except for Min, Wastell and Davies, and Gaines. Bailey, from the audience, has to talk Gaines off the stage. It doesn't happen quickly. Then Roger tells us who is going to play next: Min, Wastell and Davies. Gaines leaves the stage. Min, Wastell and Davies play a trio of delicate and indelicate string sounds. The music teams with life, like a drop of pond water on a microscope slide. Min is playing a smaller pipa than the one she has used previously. It sounds dryer, lighter, and mixes well with Wastell, who bows a little brass bell stuck between the strings of his cello. Davies makes sounds with his harp that sound utterly alien to the instrument. It is delicate and beautiful. It is also hopelessly marred by some piece of electrical equipment onstage that has decided to buzz loudly throughout. Someone from the audience who I'll bet money to be Ben Watson jumps up onstage and fiddles in vain with Bailey's amp. He does it again a bit later. The musicians play on, unperturbed. Next up, Roger tells us (after telling us who we just heard), is "Annie's group." Gosfield takes the stage with Zorn, Baron and Choi. It's the first all-American group of the night, and they seem to speak the language a bit more intuitively. But they've got an accent. Gosfield's sampler makes a pulsating bed of squizzy machine noises. Choi plays demonic music elegantly, flying up and down the neck of her instrument. Zorn and Baron make Zorn and Baron noises in reponse. Eventually, they fall into a romping funk pattern. Then they stop, and make more Zorn and Baron noises, which somehow fit together nicely with the machine sounds and the demon fiddler. Roger Parry tells us who we've just heard. Then he tells us who we are about to hear. This group is made up of Bailey, Choi and Fell. Maybe it's "Jennifer's group," but Roger forgets to tell us again. Violin, guitar and bass intertwine into a lovely mesh of strings, slow, placid, maybe even bucolic. Of course, it can't last. Bailey puts an end to "placid," interjecting dissonant chords. Fell then ends the "slow," taking off like a racer across the neck of his bass. His fingers scamper up and down the length of the instrument, not just its neck. His technique is not conservatory-precise like Choi's, but it gets the job done. Choi takes the hint and starts flying herself. When the CDs are released in a year or two, this will be a highlight. It ends too soon. Roger Parry tells us who we've been listening to, and announces an intermission. I want to go out to the lobby, but I'm too afraid of losing my prime, unobstructed view standing at the end of the bar. So I continue to stand there. But by now, you're probably not as interested in the second half of the concert so much as you're wondering whether I will continue this inane imitation of the prose style employed by Dave Eggers in his much-hyped, bestselling memoir, A Heartbreaking Work of Staggering Genius. As if someone who's only 20-something should be writing a memoir anyway, no matter how privileged by the right or obliged by the duty of the tragic circumstances of his life may have made him feel. The answer is, no, I will not. I am far too tired from staying up too late Wednesday night even after coming home from the first Company night (the one you're reading about), getting up too early on Thursday morning to see my girlfriend off on a trip, and attending the second night of Company Thursday night, which, I promise in advance, I won't review in this particular manner. Anyway, we're talking four hours of sleep, tops. And now it's after two o'clock in the morning here in New York, and I'm beginning to see little spots dancing before my eyes. So I can't imagine that I'll be able to type much longer, and of course, I'm also worrying all the while that you will all hate this essay and will rise up together and will banish me from the Zornlist completely as a result, which would mean that I would never get to tell you about the second night of Company in New York, not to mention the third night or even the cool upcoming releases announced in the new Tzadik catalogs that were laying around at Tonic tonight. And of course, were I less sleep-deprived, I'm pretty sure that writing a concert review in the style of a trendy (but still very worthwhile) book would not have seemed like a good idea. In fact, it already doesn't seem like a good idea, but since I've written this far, I feel sort of committed to see it through, though I do plan to use some sort of shortcut very soon so I can go to bed. Otherwise, you might never get my review of the second night. Or the third night! The third night is tomorrow night. Tonight! It's already after 2 a.m., like I said before. Still, in a sense, you're getting two reviews for the price of one here, since what I am really doing in this essay is telling you about the first night of Company in New York, but I'm telling it in the style of a book that many of you might have considered reading (and in fact one Zornlist member even wrote me personally to ask about the book when I mentioned it as a "NR" the other day, but that doesn't mean that that particular person -- let's call him "Xerxes" -- anyway, Xerxes, you needn't feel that you and you alone were the cause of this post, and that after I myself am banished from the Zornlist, they'll be coming for you next). When I'm finished with the essay, then, you'll know what the concert was like, really like (and here I'm wishing that the use of rich text was condoned on the Zornlist, so that I could have italicized the word "really" just before the parenthesis), and you might also have some idea whether you might want to read the book, as well, as I myself am doing. I'm enjoying the book despite its obvious 20-something postmodern snarkiness, not to mention its whiny defense of same, both of which would render the writer completely obnoxious were he less talented than he is. And I hope it is clear that I enjoyed the concert as well. Now. After intermission, Roger Parry got up again, and told us that we were about to hear "Min's group." The group was supposed to consist of Min (and it's odd, perhaps, that Roger called it "Min's group," since "Min" is, as I understand it, Min Xiao-Fen's family name, since her famous pipa-playing father's name is Min Ji-Qian, and everyone else's group was referred to by their proper name, like "Annie's group" and "Simon's group," so shouldn't the next group actually be "Xiao-Fen's group"? Just wondering. ), Bailey, Fell and Davies. However, Davies, for some reason, never came to the stage. So "Min's group," or "Xiao-Fen's group," if you prefer, consisted of Min, Bailey and Fell. And the music they played was another highlight of the evening, with Min's skittering fingers and Fell's alligator-clipped strings proved nearly as otherworldly as Bailey's typical Baileyness. JOEY'S GROUP -- Baron, Zorn, Gosfield and Bailey. Their interplay was reasonably interesting, including a funky chase to the end by Zorn and Baron. But Bailey must have heard some potential in it, because he compelled the group to remain onstage for a second blow (Zorn called for a vote of the audience), which was far more interesting, and contained Gosfield's first really integrated playing of the evening. Her hardware knocked like a bad engine and clanked like a foundry. WILL -- Gaines took the stage for a bit of old-style hoofing. After an impressive display of tap technique, he sat on a piano bench and proceeded to talk to the audience for a while longer about his storied past, performing with the likes of Ray Charles and Big Maybelle. He said that playing with Company was the biggest challenge, but that the challenge was for Bailey to keep him in line. Gaines kept tapping his feet throughout his little monologue, and it was impossible not to be moved by it. JENNIFER CHOI & MARK WASTELL -- An incredible duo of staggering technical acumen. Choi's style is picture-perfect, Wastell's catch-as-catch-can, but the two meet in the middle for chamber music of which anyone from Webern to Lachenmann to, dare I say, Zorn would have been proud. CHOI, WASTELL & GOSFIELD -- As above, but with a washing machine churning in the background. Wastell further distinguishes himself in my eyes by being the first cellist I've ever seen bowing the endpin of his instrument. RHODRI'S GROUP -- The finale for the evening, consisting of Davies, Bailey, Baron, Fell and Zorn. The barrage you might expect, for the most part. Zorn, seemingly out of patience, blew smoky, Spillane-style sax. Davies abused his harp with a tamborine and a little dumbek. The grouping rocked out at the end. As Zorn packed his stuff, Bailey said, "John wants to do another one." Zorn replied, "I didn't say nothin,'" but he gamely pulls out his toys. The second blow by this group was as good as the first, and in some ways even more distinctive. Baron played a fractured, Beefheartean rhythm over which the rest of the group was content to play without falling in sync. When Baron exploded into a barrage of noise, only Bailey followed. The climax was a trio of Bailey, Fell and Baron, the last beating his drums with towels thrown over the heads. And then, of course, Roger Parry told us who we had just heard, and invited us back tomorrow, which is, of course, last night as I type this. But that's another story.